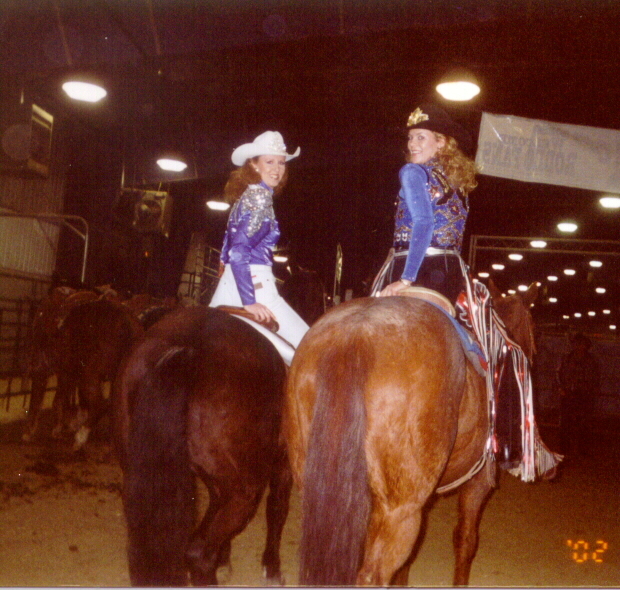 the 2002 Miss Rodeo Wyoming Compeition! the 2003 Miss Rodeo Wyoming Pageant! On January 27th, 2001 in Lander, Wyoming, dreams became reality for Miss Heather Orn of Sheridan. When the rhinestone tiara was placed on her cowboy hat, and she was presented with a bouquet of roses, a beautiful belt buckle, and the banner was placed over her shoulder, this young lady began to see her dreams coming true! 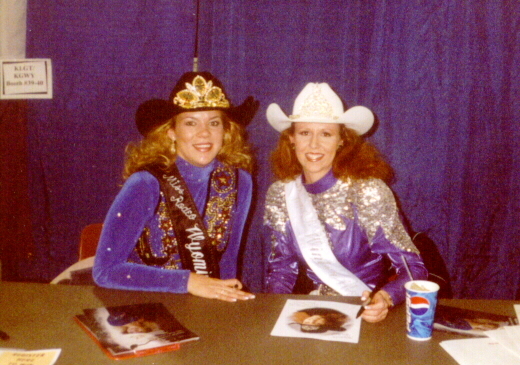 Heather had won her first queen title, the 2001 Wyoming State Winter Fair Queen! Seven contestants competed for the title, Heather was also the winner of the horsemanship award. But Heather has a new job. She is now the 2002 PRCA Winter Western Rodeo Queen! Heather is the 22 year old daughter of Darrell and Janet Orn. She is a 1999 graduate of Ridgewater College with an Associates of Applied Science Degree in Veterinary Technology. She is a Sheridan County 4-H leader, and has been involved in various sports and activities thoughout the years. But the sport of Rodeo is what this young lady is most passionate about. It can be said that hard work and perseverance pays off, but this is just the beginning! Heather will be competing for the prestigious title of Miss Rodeo Wyoming in August. As Miss PRCA Winter Western Heather will represent and promote the Professional Rodeo at other rodeos and many other activities and events thoughout the state of Wyoming during the coming year. "What is the Winter Western???" The PRCA Winter Western is a Professional Rodeo held February 8th, 9th, and 10th, 2002 at the Cam-Plex in Gillette, Wyoming. Hank and Lori Franzen of Powder River RodeoCompany have produced this rodeo for nearly 15 years. Throughout the weekend there are three rodeo performances, and a huge trade show, and many other activities taking place at the Cam-Plex. Don't miss the fun and excitement, see you at the Winter Western! "So what has Heather been up to???" As Miss PRCA Winter Western Heather will keep busy during the coming year traveling to rodeos and making appearances at events and activities throughout the state of Wyoming. During the Winter Western she will carry flags and clear cattle from the the arena during performances. She will also be doing a radio interview, signing autographs, and making appearances. Next Heather plans to attend "The Rodeo, The West, and The Lady," a three-day rodeo queen seminar in Casper. Including all the traveling and appearances Heather will also be spending many hours preparing for the Miss Rodeo Wyoming competition to be held during the State Fair in Douglas. "I would just like to take this opportunity to say "Thank You" to Hank and Lori Franzen for appointing me as the 2002 PRCA Winter Western Rodeo Queen. I also want to thank my sponsors, friends, and family for making the past year a success, I couldn't have done it without you! I am looking forward to another fun and eventful year!" taken during the PRCA Winter Western in Gillette, Wyoming. The Town & Country Style Show at the Cam-Plex. Miss Rodeo Wyoming, Tausha Simkins, and I before the rodeo. Signing autographs at the Cam-Plex. the American Flag at the Powder River Roundup! 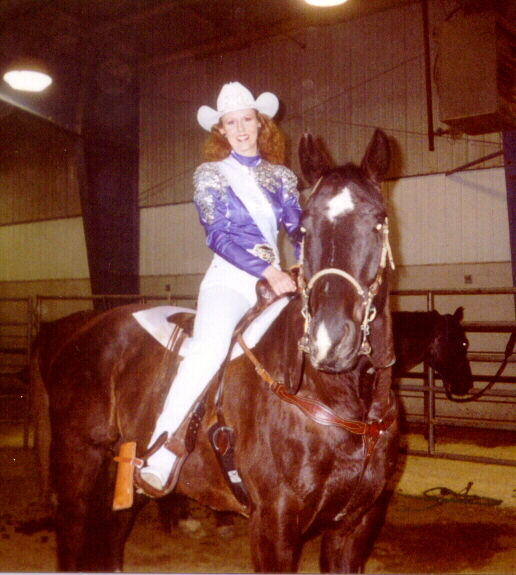 2002 PRCA Winter Western Rodeo Queen! Thanks also to these special supporters! Back to "Heather's Rodeo Page"